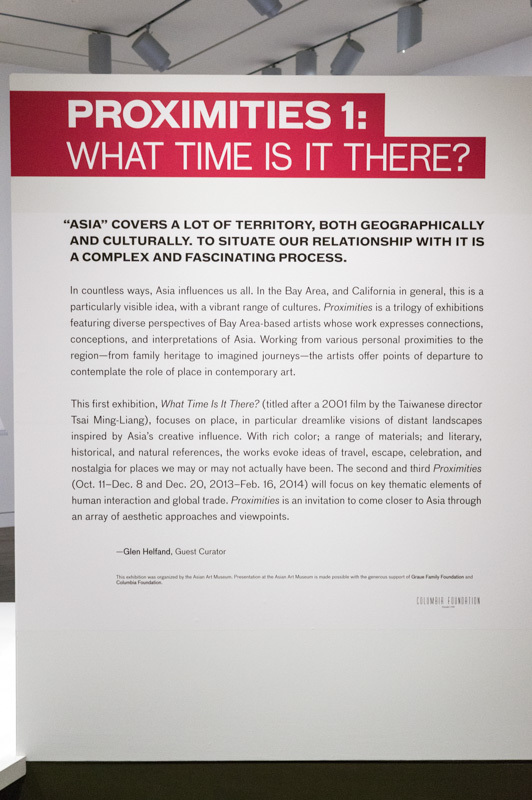 In 1988, Gayatri Spivak asked, “Can the Subaltern Speak?” Sadly, a full quarter century later, the answer at the Asian Art Museum of San Francisco is still, “Just barely.” For the Proximities 1 exhibition, the Asian Art Museum hired a white male curator with admittedly no background in Asian art to curate a show of contemporary work by local artists with a central theme of “What is Asia?” This white curator in turn put together a show where six of the seven artists are white, a number of whom—like Ruth Benedict—have never even been to Asia. What is “Asia”? And who gets to answer? Proximities 1‘s “concept of ‘Asia'” revives the 18th century quest for paradise called Orientalism, a racial ideology of absolute difference in the false binary between here and there. The Bay Area is home to the third largest Asian population in the United States. Six of the Top 10 Cities with the Highest Percentage of Asians in the U.S. are in the Bay Area (Daly City, Fremont, Sunnyvale rank #1, 2, 3, respectively in the continental US). More than one third of the population of San Francisco identifies as Asian. (Note: one third of Sanford, Florida, where Zimmerman was tried, is black). Whites are a minority in San Francisco. Final Question: Why is “Asia” at The Asian always Over There? Or: Why this could never happen at MOAD or the Mexican Museum This summer we’ve seen a lot of art by local Asian-identified artists at Bay Area museums. Oakland-based Hung Liu recently had a major retrospective at the Oakland Museum and currently has a show at the San Jose Museum of Art. SJMA is also showing “New Stories from the Edge of Asia,” which consists entirely of the work of Asian American artists. In 2008-9, the de Young hosted a major survey of work by Asian American artists spanning 1900-1970. Why is art by Asians living in the U.S. always at museums other than The Asian? Why is “Asia” at The Asian always already “somewhere else” other than here? In contrast to the Museum of African Diaspora and the Mexican Museum, the Asian Art Museum makes no acknowledgement of centuries of transnational migration in its mission statement. Contrast this with the “Migrating Identities” show currently at Yerba Buena Center for the Arts. How does The Asian’s narrative disavowal of the history of Asians in America contribute to the pernicious ‘perpetual foreigner’ stereotype that reared its ugly head last week? I appreciate this opinion piece for the questions it raises about the Asian’s mission overall. Cheers to the Asian for posting it on your blog. I think it’s interesting that there’s no byline, leaving the author’s identity–personal and racial–a mystery. But I’m guessing that the patrons/donors/board are of a class and generation that wants their “Asia” mystical, enlightening, beautiful, wise, i.e., traditional. Identifying with traditional Asian is a subtle countercultural rejection of Western culture that demonstrates tolerance without having to acknowledge racial tension within the US. For Americans disappointed in materialistic consumer culture, nationalism, our insistent philistinism and so on, Buddha heads, calligraphy, samurai artifacts, etc are conveniently uncomplicated cultural signifiers spirituality to “consume.” For the Larry Ellisons of the world, admiring the noble “other” via the artifacts of bygone Eastern empires could be self-differentiating while concordant with upper class tastes. The fact that a white man curated a show with mostly non-Asian artists at an Asian art museum in itself doesn’t bother me. For example, Hank Willis Thomas and Natasha L. Logan recently curated a show called “White Boys” at Haverford College, featuring mostly white males. It’s an interesting inversion of a paradigm. But the larger representation of artists in the gallery’s overall program was offset by the fact that Hank himself had a show there, including Question Bridge: Black Males. Thank you, Christine, for sharing your thoughtful insights. The blog post was created by our communications director and chief content strategist, Majime Sugiru, who is Asian American and an artist in his own right (who showed with you at Soap Gallery a couple years back). I agree with your reasons why Asia at the Asian is exoticized, but would like to take it further, to question what it means for a city-owned public museum to do this, especially in a Pacific Rim city with such a large and vibrant Asian population (and this museum in particular is not just owned and funded by the city: the taxpayers paid a $100 million tab to bail The Asian out of debt a couple years back). Shouldn’t a commitment to the collective good in the form of cultural stewardship be in the charter for such a civic arts institution? Isn’t it the role of a civic institution to enable equal opportunity for full citizen participation in public life and culture? If so, how can a museum serve the cultural health and welfare of its communities if it historically and routinely excludes stakeholders from the community whose culture it putatively most represents? As a proud owner/wearer of an early Hank Willis Thomas t-shirt, your point about racial representation in and of itself is well taken. But whiteness in this case is not simply about the skin color of the curator or most of the artists, but racial inequality as a practice, intentional or not. A primary difference between Hank’s show and Proximities 1 is not only the concurrent presence of a show of his own work, but also in the avowed intention to consciously explore whiteness. Proximities 1, on the other hand, advertises itself as an exploration of Asia when it’s really an unabashed expression of whiteness (white imagination, the privileging of white perspectives, the invisibility of the privilege being exercised), from the framing and choice of theme to the systematic exclusion via racial proxy to the denial that the show is about race while asking framing questions that are very clearly about race (e.g “Does one need to be Asian or Asian American…?”) to the outcome of the show itself (where one of the white artists who has never been to the Philippines writes, “My curiosity about the Philippines began when I was ten years old, when my brother-in-law, who is from Manila, entered the family. He shared stories, traditions and food with our very American clan, and I was captivated…” What is being conveyed here about what constitutes “American” in a show that frames Asia as distant other, and how does it condition its audience to relate to folks like you and me, or to condition assimilation?). The invisibility and power of whiteness lie in its normativity, something we’re all socially conditioned by, which implicates each of us in creating the racial inequality that surrounds us, again regardless of intent (via implicit or unconscious bias). We live in a world where no one is racist—not Zimmerman, not Johannes Mehserle, not even Anders Breivik—and yet irrefutable evidence of widespread systemic inequality is no further than the nearest Tim Wise book. While white privilege operates invisibly and unintentionally via unconscious bias, the racial narratives that are produced are quite conscious and expressed all the time, through cultural productions like Proximities 1 (perhaps the absence of race-critical writing about this show, other than this one blog post, speaks itself to the extent of this normativity). While it’s a ‘post-racial’ myth that racism today is only constituted by the deliberate, isolated acts of blatant animus by individual bigots that we all reject, at the same time a pitfall of referring to racism as a structural problem is that we too easily overlook the fact that inequality is actively practiced by individual decision-makers every day, including ourselves. Looked at through this lens, we can start to see possibilities to work towards racial equity, even in institutions like The Asian: by consciously examining the “choice points” that influence outcomes, to no longer systematically exclude key stakeholders, overlook barriers to access, and fail to consider racial impacts. Had racial equality been consciously practiced in this way, how differently might Proximities have turned out? “Choice points” around basic thematic framing, choice of curator (it wouldn’t have been hard for you or me to come up with names of highly qualified individuals who actually do have a background in the subject), inclusion of key stakeholders from the outset, accountability vs denial of racial impacts, and so on. Maybe the first step is to realize that being “not racist” is not good enough, that if we are not consciously engaged in enacting or addressing racial equity, we’re all unconsciously practicing inequality. ([White] People might debate my use of the term “whiteness”, but as Imani Perry writes, “White identity as it relates to conceiving of oneself as nonracist is largely defined by a ‘not that’—not southern, not working class, not Confederate-flag bearing, not descendant of slaveholders, and so on.” From More Beautiful and More Horrible, p. 193). While inequality may be largely an unconscious practice, equality can only be enacted through consistent, committed engagement. A key avenue for that can take place in the shifting of racial narratives, like that expressed by Proximities 1. Oh! Foiled! I just realized this is not the official Asian site. Or conversely, is it this blogpost that is racist? According to post-racial color-blind ideology, isn’t it imagined that to see “race” at all, let alone speak of the particularity of whiteness, is itself racist? Proximities 1: What is Whiteness? What should the museum do? Samurai sword attack in SF’s Tenderloin . . .